Another one is in Penang. Anson Road. This one is just RM38,000,000. There are 9 rooms, thus you are paying just RM4.22 million for one room which is very slightly more expensive than the one in Japan Yap Kwan Seng. However, this bungalow is huge. 25,000sf! Furthermore Penang is an island which meant land is really limited. The third highest is in Damansara Heights. This seems cheap, just RM36,000,000. However, when you look at the rooms, there are just 6 rooms. This meant each room is worth RM6,000,000 which is really highest compared to the two above. Maybe because of the word, ‘Heights’. 🙂 Total size is also smallest, at just 7,300sf. 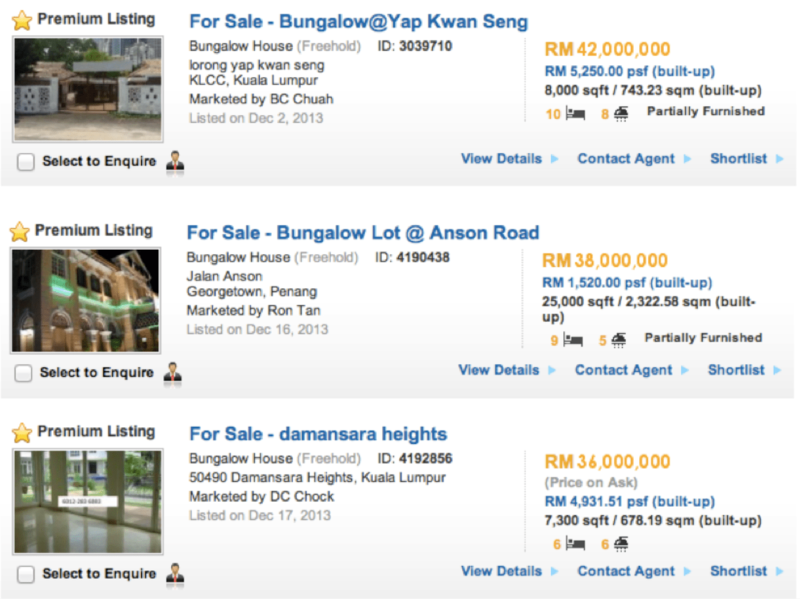 So, if you want these three, better be fast, I am quite sure there are a lot of people who has RM50,000,000 cash and may want to grab one of these before it is sold. Alternatively, you may proceed to buy 10 units of RM1,000,000 condos. Perhaps buy the whole floor. Then, you can save the rest of the money for renovation, holidays with the whole family etc. Of course, the only different thing maybe you cannot park the cars within your compound and you would need to share all the facilities with so many other people. Okay, time for me to go to bed and start dreaming.